Disney has adapted a number of their movies from the big screen to the big stage: The Lion King, The Little Mermaid, Beauty and the Beast. Now, they’ve set their eyes on Aladdin; the story of a “worthless street rat” that goes from rags to riches with a little help from his friends and the Genie. 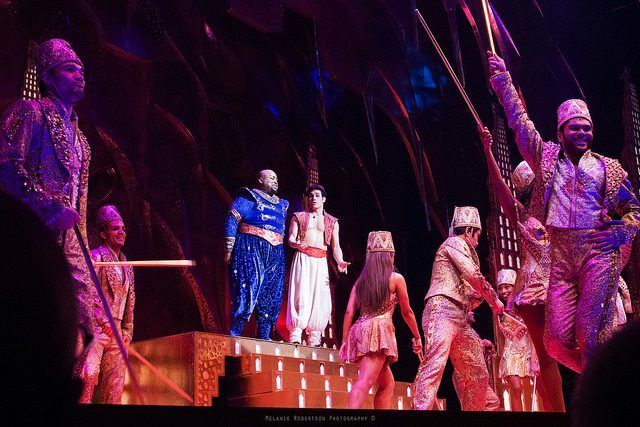 This family-friendly show explodes with bright colors, billowy costumes and every other fantastic detail from the Arabian-fantasy world of Agrabah. Aladdin is playing now at the New Amsterdam Theater, NYC. The show runs 2 hours and 30 minutes, and there is one intermission.